Take one of our cooking holidays in Italy and learn the passion of the Italian kitchen - and have fun doing it. Our cooking holidays in Italy are given in fabulous Tuscan villas that have been restored without taking away the authentic and exquisite Tuscan charm. Both villas, Casa Ombuto and Torre del Tartufo are both in set in the Tuscan hills with fabulous views but yet only an hour away from Florence. Our cooking holidays in Italy will allow you to immerse yourself in the culture and lifestyle of Tuscany and learn to cook authentic Italian dishes in an informal and friendly environment. The lessons are given on location in beautiful kitchens, which have been designed for this purpose. So get ready to roll up your sleeves and get chopping! The groups are generally a mix of couples, singles, and friends traveling together. Everyone is there to enjoy the experience of cooking and eating together and meeting new people so never a problem for people traveling alone on a singles vacation. Paola Baccetti in Casa Ombuto and Franco Palandra in Torre del Tartufo teach our cooking holidays in Italy. 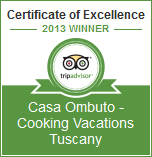 We also offer a Mediterranean course at Casa Ombuto, which is given by Italian chef, Laura Giusti. Choose a cooking holiday in Italy, which suits you best. The Tuscookany cooking holidays in Italy offer a comprehensive hands on course designed to teach you to make splendid 4 course Italian dinners covering all the basic Italian cooking techniques and inspire you with recipes that are authentic Tuscan from pasta to pizza, many sauces, desserts and dough's. We strive to use organic vegetables in season which we grown locally or buy from local farmers. Throughout your cooking holidays in Italy you will learn about the ingredients and the traditions around the dishes as well as food presentation and wine choice. The culinary excursion will take you to visit local producers of olive oil and see how it is produced; you will visit a unique cheese farm and taste the local produce. After time for shopping you have a wine tasting in an Italian manor ends the day before going back to the villa for dinner. If you are looking for cooking holidays in Italy that will inspire you with the knowledge and enthusiasm to cook authentic Italian cuisine then join us at Tuscookany. More information on our cooking holidays in Italy is available here.